We kick off week 3 with Melbourne Cup day and a public holiday in the town of Aramac! 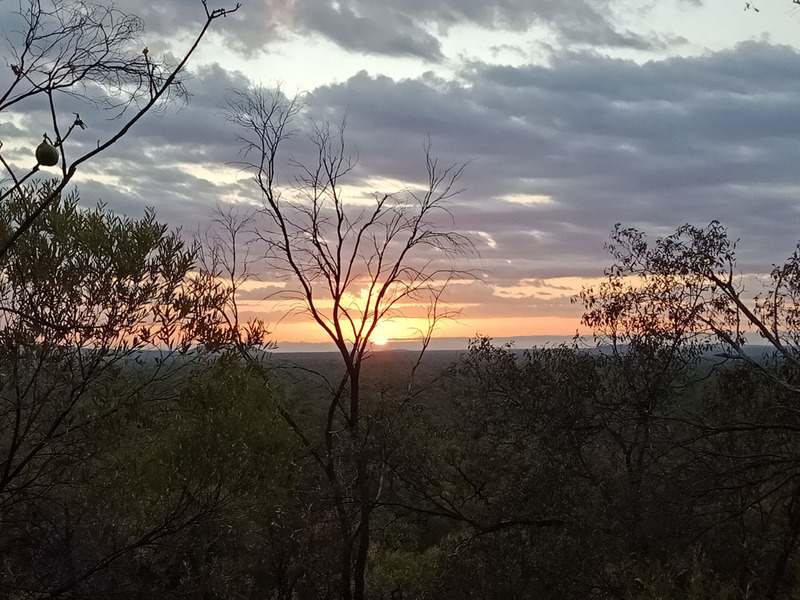 Our hosts fell in love the the Kimberley boys, and according to the MC Dawn ‘The Best’ James, Harry & Elwood were lucky all the local ladies were married because otherwise they wouldn’t have been leaving Aramac! 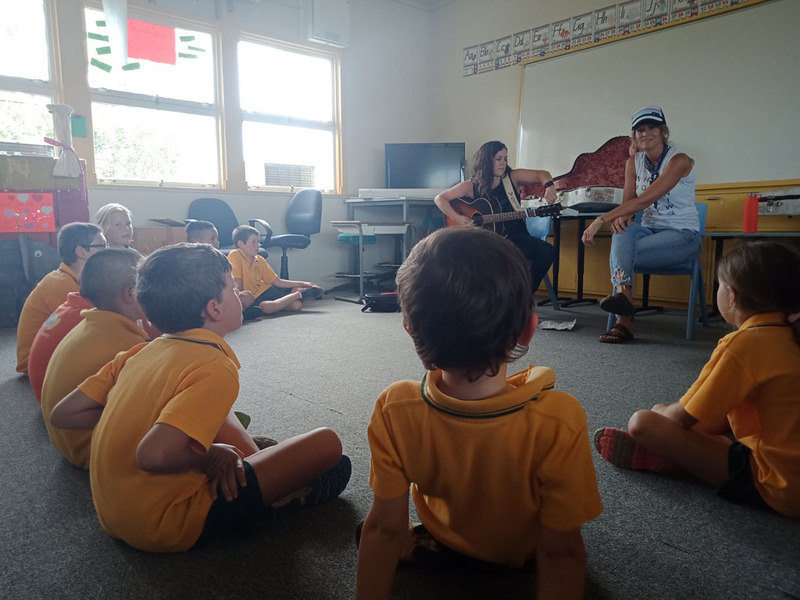 Lisa and Brenley popped into the local school in Muttaburra sharing and finding the harmonies that existed in this dinosaur country. The participants even got their time to shine that evening performing alongside Madison Violet! We were way out west, under the beating hot sun, trying to welcome the storm that skirted around us. We’d been travelling well keeping up the liquids, but then unfortunately the best production manager in the world hit a roo. First time in five years of Small Halls and this one made its mark! With the radiator and power steering out of action we jumped into action and tried to make the next gig – swapping out clothes and essentials for guitars and fiddles, squishing as much as we could into our little Carnival – we were determined to make Moranbah and perform acoustically! 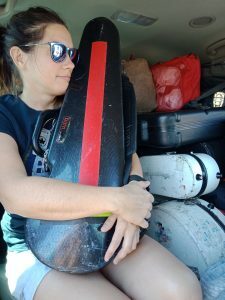 Lisa tries to squeeze in with the luggage! But with the fate of the van on the side of the road, we had to make an executive decision and halfway to the gig we had to cancel. The artists sent all their love, and apparently Moranbah went right ahead and still went to the hall to listen to the CD’s and enjoyed their own variation of the night! With a new van to fit five musicians, baggage, six guitars, a banjo, fiddle an amp and of course a coffee plunger, we farewelled ourproduction manager for the weekend and hit the road for a 10hr drive to Undara National Park. We were greeted with a tree snake, green tree frogs, had a delightful rest and morning strolls through this gorgeous country. We were welcomed into Georgetown & Dimulah, harmonised with the local community, conversed with a bunch of the local farmers, had the wonderful Mitch Steele and Aurelle Brunjes open the evenings, and karaoke kicking off as we loaded the van and waved goodbye. Week three ended with 2,098km travelled and two final great turnouts and a fresh bag of mangoes! After a relaxing day in tropical Cairns, we headed down the coast road to Mackay turned right and headed back inland to Nebo. We arrive to the beautiful sight of our production manager Harry, with all the gear set up, the bunting blowing in the breeze and our beautiful sound back on track! We really missed him! 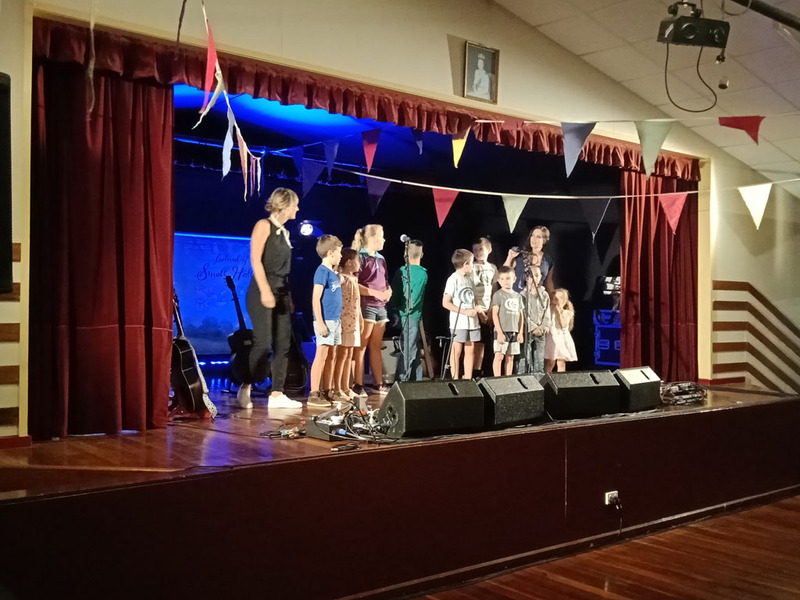 Week four was a week of records – we had our smallest hall in the tour – 70 people at capacity in Ilbilbie and our 6ft something Elwood nearly didn’t fit on the stage. We had a sell out show in Kaplower squishing as many people into that small hall as we could! We also camped out proper festival style in Goovigen in some gorgeous Glamping tents, and had communities putting on festivities all day until the musicians kicked off in the evening. 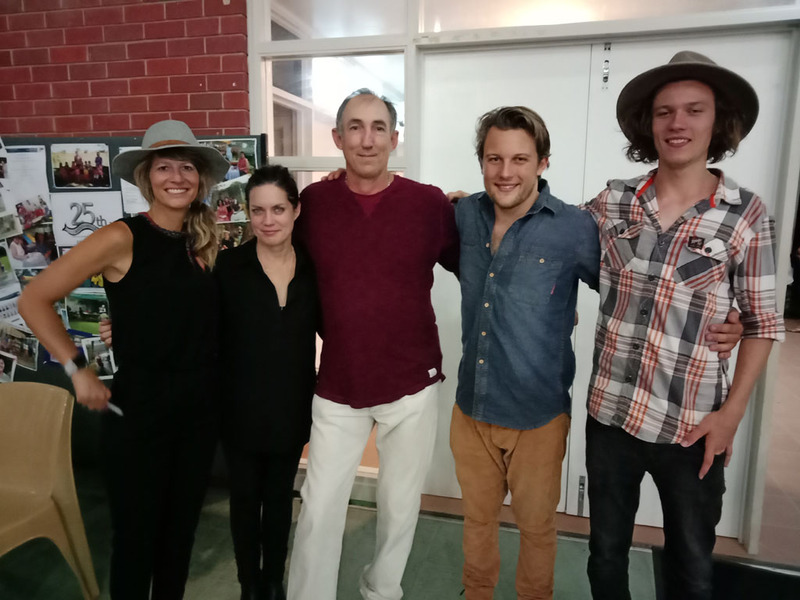 Over the week we travelled 1,982km south and we rounded our tour off with a show at the first small hall we drove past – Felton Community Hall! We’ve had so many laughs, so many plans for Canadian and Western Australian tours between Harry Jakamarra and Elwood and Madison Violet, seen some amazing country, 19 gorgeous small halls and countless conversations with wonderful people from all sorts of backgrounds. After four and a bit weeks together and 6,513km the hugs were long as we said goodbye for a few days and let the muso’s rest up for their final hurrah at Queenscliff Music Festival!